Researching my family tree unveiled that nearly all of my relatives left small, and in some cases very small communities in Europe. It was my 2nd great grandfather on my dad’s side of the family that called this place home. The nearby village of Gaulsheim is where they lived but this community was absorbed by Bingen to create one city. Bingen is located at the intersection of the Rhine and Nahe Rivers. One thing that became clear after a short history lesson on the region is that it was constantly changing hands. Before Germany was unified there was a constant switching of ownership and loyalties and Bingen’s special position made it prime real estate. I always wondered why my family left their homes in Europe but this trip helped me see that life in Germany, and Europe in general at this time was far from stable. Today its location makes for a nice stop off point on a Rhine River cruise. Instead of choosing one of the more busy stops, get off in Bingen and discover small town Germany. If you’re traveling via train, there’s also a train stop in the downtown area of Bingen. 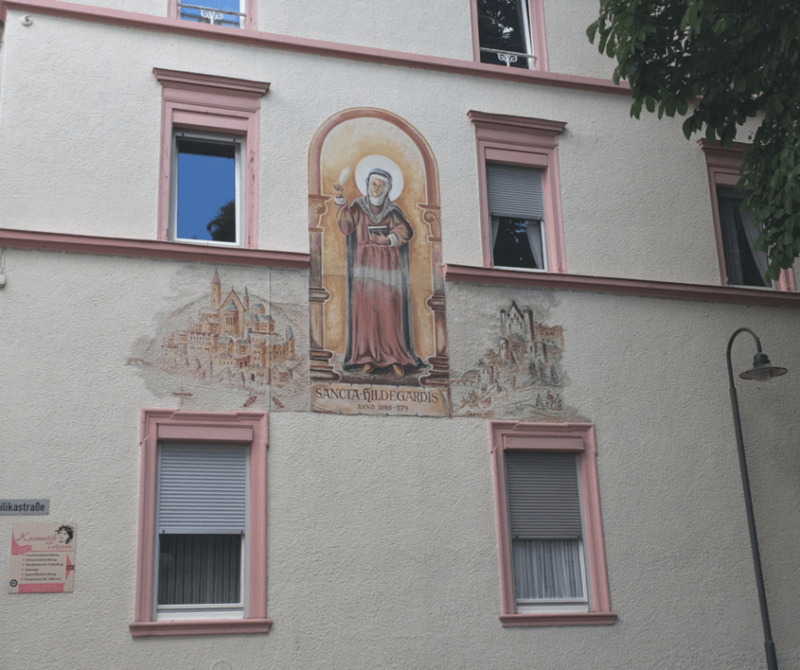 The most well known resident of Bingen wasn’t my great great grandfather but of a woman; Hildegard von Bingen. There are few women named and recognized throughout history making the story of Hildegard even more notable. It’s hard to imagine that someone born in 1098 would still be remembered and revered today, but she is! Hildegard was the youngest of ten children and came from a minor noble family. From a young age she had visions and at a young age she became an anchorite, a medieval tradition of penance and seclusion. In 1141 Hildegard began to write down her visions, which she believed were a direct communication with God. A friend, and monk would translate her writings to Latin for the book that was eventually completed; Scivias. Her visions were often interpreted as a way to speak out against the overt patriarchy of the time and the corruption that she saw within the Catholic church. It was these visions that were used to challenge what she saw as wrong in the church. By 1148, after a fight with local monastery leaders, Hildegard built her own monastery. (It was later destroyed in 1632 during the 30 Years War). She wasn’t just a spiritual leader. Hildegard was also a musician who composed hundreds of pieces of work. 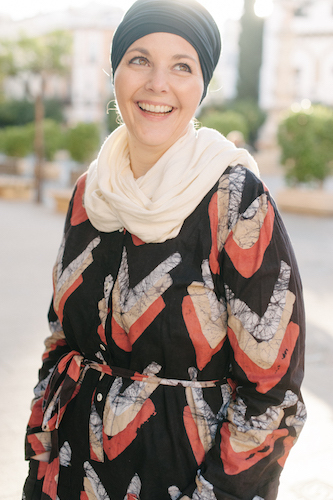 She was a healer who taught and treated with a combination of medical knowledge of the time coupled with solid nutrition, rest, and treating the entire person and not just the symptoms. Hildegard left behind an astounding body of work, rare for many people of the time but even more rare for a woman of this time. In 1179 she fell seriously ill and passed away. For centuries she vanished from memory until the 18th and 19th centuries when the German Romantics rediscovered her and brought her “back to life”. In 2012 she was recognized as a saint by the Catholic church. It’s safe to say she is a major draw to the region and people still come just because of her. We ate lunch at Hildegard Forum der Kreuzschwestern, located above the city. 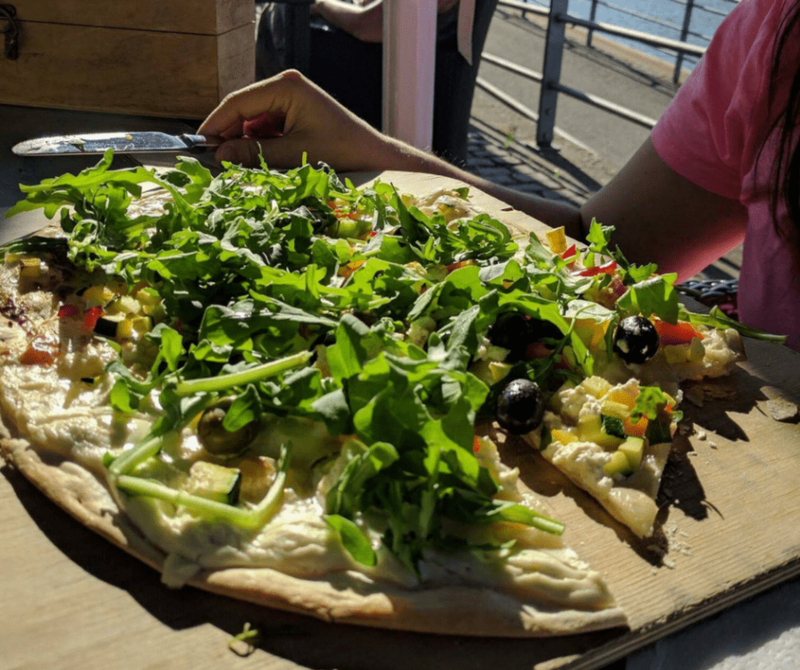 This restaurant is open for lunch and focuses on traditional German food and using local ingredients; an homage to Hildegard’s philosophies. The cooking is all done by the cloistered nuns who live here. As mentioned, this is a small city so there’s not a lot of activities but there is enough to easily spend the day! While there are some tours that can be taken inside the tower it might not be necessary. Instead take a look from the banks of the river or on a boat cruise. Rumor is the ruler Hatto II was a bit of a despot and used the tower to get tribute and harass passing ships. During a famine local peasants were starving while he had stocks of grain in his barns that were being sold for inflated prices. He then told peasants if they came to his barn he would give them grain as a goodwill gesture. When they arrived they were instead locked in the barn and it was set to fire. When he returned to his castle it was over run with mice that followed him as he fled to the tower on the river; where they ate him alive. No historical proof has ever been found for this but it makes a good story! 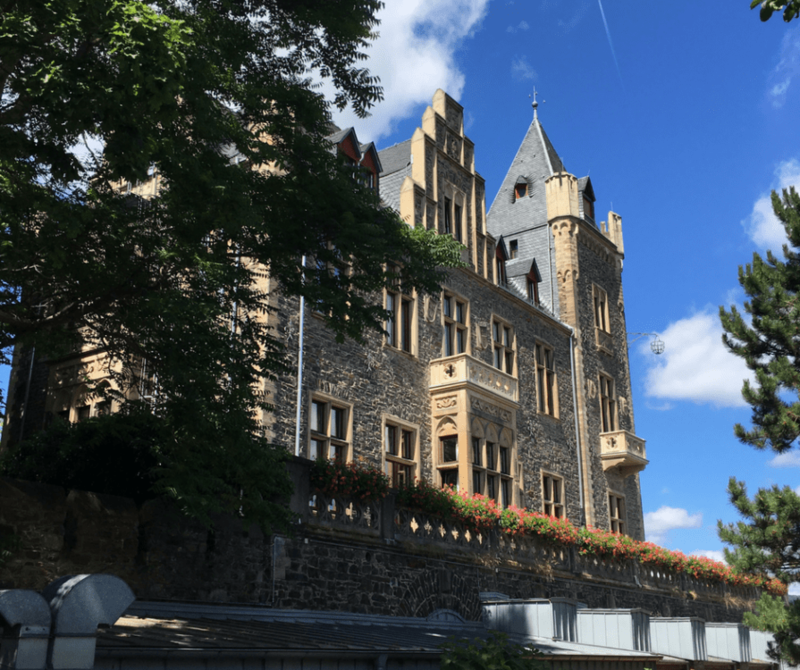 Located on top of a hill in the city, the Burg Klopp was the site of medieval castle but it was virtually all destroyed when in the late 1800’s it was converted to a mansion in the romantic style of what a medieval castle might have been. The grounds are really nice to walk around in the summer months and if we had younger kids there’s a really great playground on the hill. The first thing we saw when we arrived at the train station was a massive crane that looked like something from Thomas the Train! This crane has been in operation since 1487 as a way to load and unload things from river boats. It took two men walk/running in a giant wheel inside to lift the mechanism up and down. Operating the crane was a well paying job at the time due to the danger. You can book a special tour that allows you to go inside and see how it works, or visit the historical museum to see a small model replica of how it works. 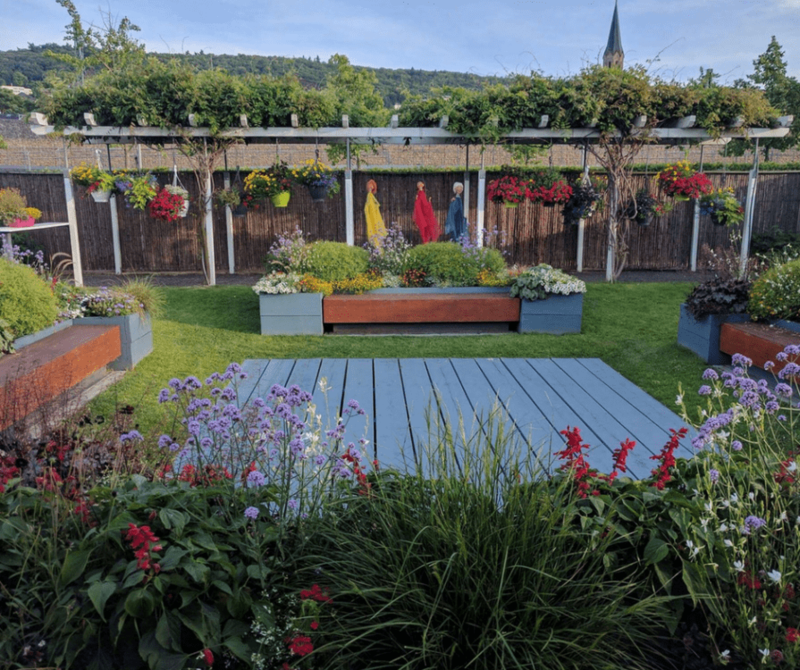 Bingen has a really lovely boardwalk along the Rhine River and they’ve used some of this space to create community garden spaces and a playground. We walked through each of the designed gardens and found them a really nice respite on a summer evening. The playground is made to look like one of the big ships that sail up and down the Rhine carrying goods and people. The local community has done a really good job of preserving artifacts about the history of the area from the time of prehistory through the present day. If you love history like I do then you’ll want to take a visit. There are also special exhibits that rotate through the space. As we don’t drink I didn’t have a lot of insight into which wineries would be great to visit but this area is covered in them! This is the heart of German wine country so if you do enjoy a glass there’s no shortage of places to go. As mentioned, I think this is one of the most lovely parts of the city, especially in summer. We had dinner at Zollamt which was excellent. The service was good and the food was great too. There were lots of options and it was so nice to sit right on the river. There are several other restaurants right in this stretch. You also could get an ice cream and take a stroll. 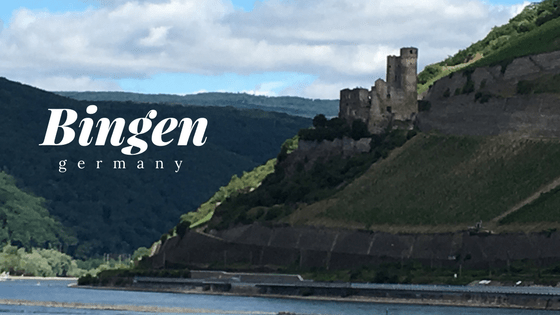 I learned a lot about my family history by visiting Bingen and nearby Gaulsheim. I learned even more after understanding the history of this place and doing more historical research but I’ll be sharing all about this mystery later! I highly recommend taking a stop in Bingen, as an alternative to the more heavily touristed towns nearby. You’ll get a very different feel to the area and not need to fight the crowds! Special thanks to the Bingen Tourism office who helped make this trip happen! If you’re visiting be sure to check out their tourist office between the main train station and boat dock. I am very happy that my hometown Bingen has gotten so much visitors traffic. It has truely blossomed and that is a wonderful thing.I am so happy. On my bucket list is, to take some friends from Atlanta and show them the beauty along the Rhein with a long boat tour on the Rhein, me as their tour guide.